Aerodynamics, noise, and fuel economy (oh my!) are all affected by speed. So I knew I wanted to test on a road that would let me drive faster than 45 mph for an extended period, but not a road with lots of traffic and fluctuating speeds (such as the local Interstate highway). Different road surfaces produce differing levels of noise, too. New, smooth asphalt is quietest, while concrete and chip-seal are noisier. Concrete also has joints between the slabs that affect sound measurements. 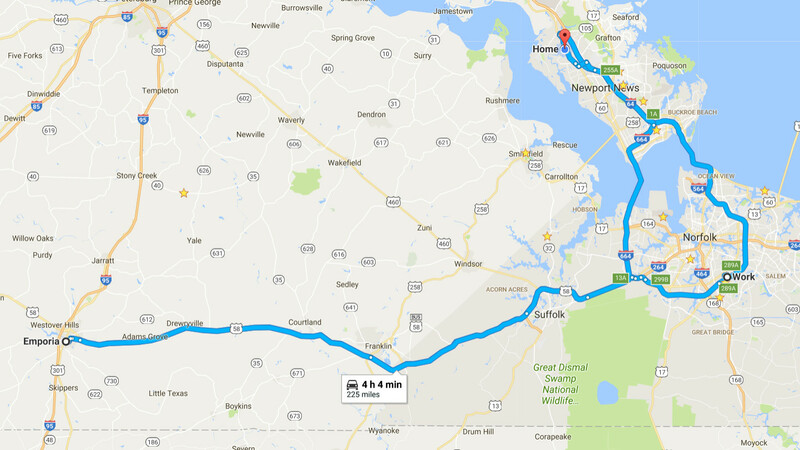 I found a lightly traveled stretch of asphalt road that worked great. The “lightly traveled” part is important because noise from other cars affect sound measurements. Also, modern cars are insulated to the point that music and ventilation add to the noise measurement. Therefore, I took all measurements with the music and ventilation OFF, unless otherwise noted. I took all measurements with a BAFX3370 sound meter. It takes A-weighted measurements (dBA) and is easy to use while driving. 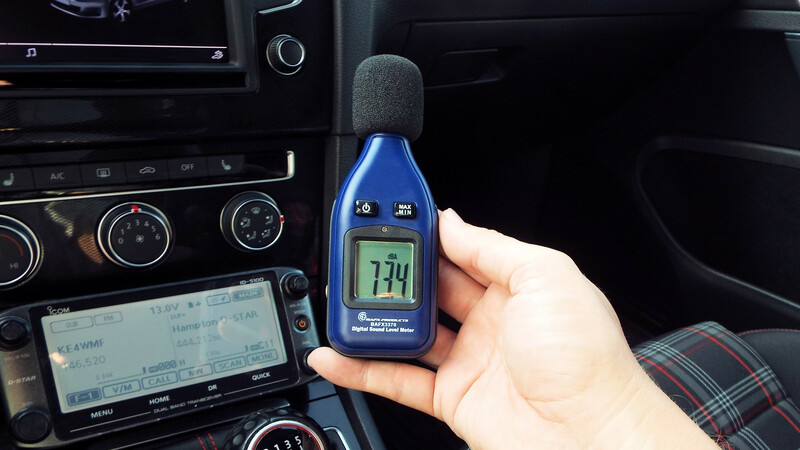 The tricky part is that sound levels fluctuate while driving. So my published values are averages with a variation of ~±1-dBA. It’s not incredibly precise, but the consistent environment and measuring procedure should provide a useful comparison between the various setups. 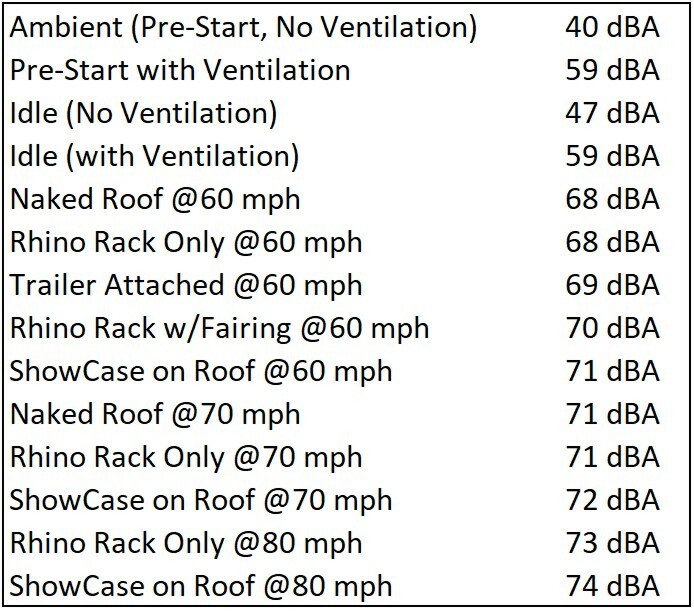 Rather than slip numbers into a paragraph, I’ve created an image with a table that shows all the measurements for quick comparison. Click the image below for specifics. I started with some baseline measurements: ambient before start, key-on with ventilation, and engine at idle (ventilation still on). It was immediately clear that the ventilation is louder than the engine at idle. So I added another idle measurement with the ventilation OFF. My on-the-road measurements include naked roof, naked rack, naked rack with fairing, rack with cargo box, and naked roof with trailer (just for comparison). Again, music and ventilation were OFF to remove their effects from the measurements. I was pleasantly surprised to hear almost no difference with the roof rack mounted. I could hear a change in sound, but there was no measurable difference in sound levels. At 70 mph, I could hear what sounds like a crosswind; this effect increases at 80 mph. But, to be honest, the noise is barely louder than the tires on concrete roads, the ventilation set to medium-high, or music at moderate volume. Click the image for a larger view. 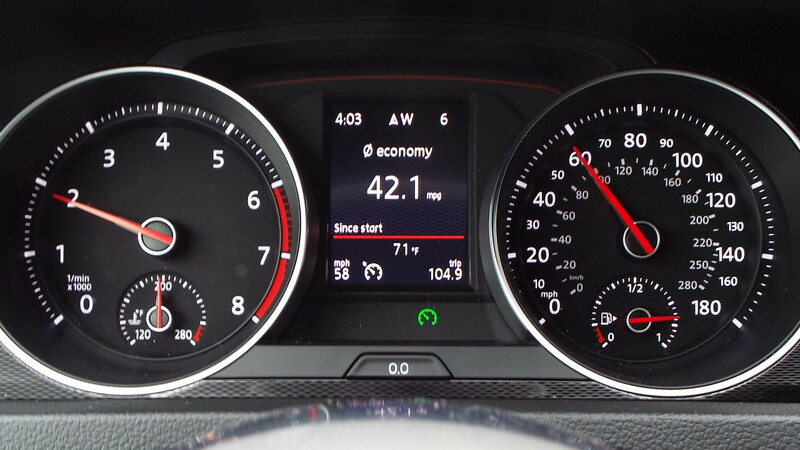 Next, I took some fuel economy measurements. This is where my measurements become a bit less scientific. Unlike with my diesels, I cannot fill my fuel tank “to the brim” without flooding the fuel system’s evaporative emission charcoal canister ($$$). As a result, there is some slop between fill-ups. Did I fill it to the same level each time? There’s no way to be certain, even if I used the same fuel station and dispenser each time I refueled (which I did). I could only do my best to be consistent. Each figure I present is hand-calculated, miles driven divided by fuel dispensed. The “Economy” display on the cluster is not accurate and is usually quite optimistic (I must admit that it’s closer to truth when towing than when unloaded). It’s a nice guideline when driving, but I make my fuel economy claims from actual measurements and calculated results. I used a 225-mile course with speed limits between 55 and 60 mph, which means I drove 60-65 mph most of the time. Exceptions include one spirited blast around a slow-moving 18-wheeler (80 mph with trailer) as well as previous data from high-speed trips on the Interstate. Since the course also includes my commute to work, there were periods of sitting in traffic or driving at 70 mph. I also ran the air conditioner for all testing. Again, this was not a perfect test, but a fair comparison between the loads on a consistent course. 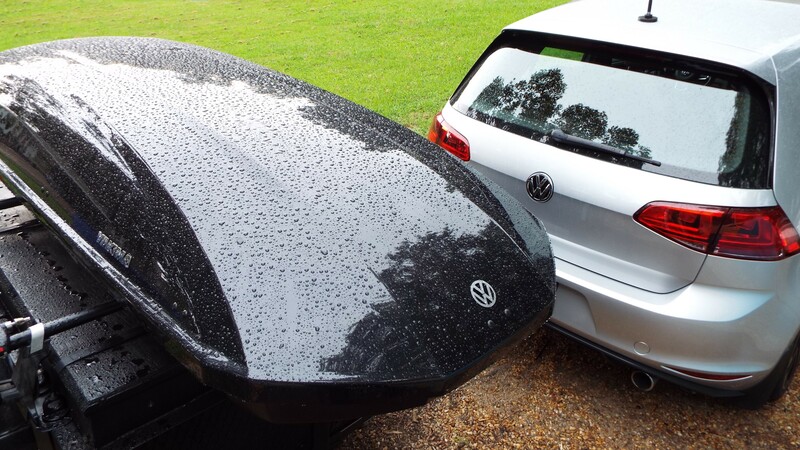 In short, I was comparing the difference between travelling in a 3100-lb car with cargo inside, the car with a 56-lb cargo box, the car with a 350-lb trailer in its draft, and then the car with a cargo box on its trailer. I’ll use the observations to make decisions about how I want to carry loads on road trips. It’s not hard to see that I spent about 1000 miles on the road to test these setups. It’s far less troublesome to just drive and not worry about the details. But where’s the fun in that? 😉 Ah, the things I do to satisfy my analytical curiosity.